An overview with historical background information of peasant struggles and land struggles in Indonesia. The young republic first took over the laws of colonial power, added by the principle of 'land to the tiller'. Absentee landlords were dispossessed, but hardly any land was actually redistributed. In 1960 the law of the 'land reform' capped private land-ownership and entitled every peasant to land. In principle this law still exists today, but it has never been implemented. Still, the millions of poor peasants who were organised in the peasant front of the communist party PKI often took the land redistribution into their own hands. The massacre 'of the communists' after the military coup in 1965/66 was largely a massacre of poor peasants by rich landlords, who feared for their landed property. The dictatorship under a tried to push a 'Green Revolution' on the state plantations, but without much success. The state plantations administered not only the old state land property, but they also grabbed the peasants’ land, particularly of those 'communist' peasants who did not dare to resist. According to Abdurrahman Wahid, the president in 2000, around 40 per cent of the property of the state plantations had been stolen from poor peasants. The poverty in the countryside did not decrease. The struggle over land has two front-lines, which partly overlap. Firstly, since the fall of Suharto a lot of peasants fought for the return of their land, which had been grabbed during the times of the dictatorship and handed over to the state plantations. Many (legal) cases are still undecided. Secondly, for the few years the conflicts between peasants and private plantation corporations have been on the increase; by some means the corporations got hold of the rights of utilisation and now claim the land of the peasants. In most cases the plantation corporations acted under a local name. 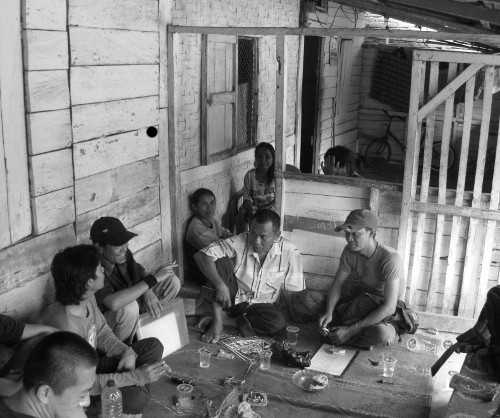 Usually the authorisation for utilisation of the Bupati is silently extended to the neighbouring rain forest. If the ministry for forests discovers this transgression, the corporation changes its name. At that point the rain forest will have already been cleared so the administration of the 'cleared land' automatically shifts to the Bupati; or the forest will directly be transformed into 'secondary forest'. The corporation Newmont, for example, makes use of the aid of NGOs, which 'rescue' Orang-utans – or if necessary, tigers etc. – by catching them and transferring them to nature reserves. If there are no animals, which have to be saved, the forest becomes 'secondary forest'. The former peasants try to use the money to create new sources for making a living, which often fails – how many taxi drivers or small shopkeepers are needed in a village? Sooner or later they end up as agricultural workers on the plantations; only a few manage to move to the cities. The protests of peasants or former peasants have been contained by the united power of capital, state and the church (in this case the Protestant Batak Church). A climate of mental and physical intimidation has been created. The previously calm, backward and poor Tapsel is now divided into three districts, there are hotels, three airports and a station of the mobile task force of the special police. The guy who reports on the situation in Tapsel is an experienced activist of the trade union and environmental movement in North Sumatra. His family still lives there on their own piece of land. He currently does not see a chance to build an open protest movement. He therefore wants to tackle the issue from a different angle: the labour productivity of the peasants is extremely low. He thinks that if the peasants became less poor, they would also be less prone to fall for the deceptions of capital. Last year he brought the first mechanised hatchet to his village. The peasants of the village Persil 4, situated about 40 km from Medan in North Sumatra, became victims of the anti-communist campaign after the Suharto coup in 1965/66. In 1956 the land was handed over to them as official property, but after the coup they were expropriated in favour of the state plantations. After 1998 two older men started to drag out the old property deeds and tried to convince the other peasants to reclaim their land. This entails around 400 families claiming between 0.8 and 2 hectare each. They undertook years of effort trying to overcome the fear, which was still prevalent, and to convince the young people who had already found some income in the cities. They went down the legal path, but also chose a direct one: the first occupation resulted immediately in violent clashes with thugs who had been hired by the state plantations in the urban areas. Several people were heavily injured – the attacks happened under the supervision of a massive police deployment. The repression caused slight discouragement of the people involved, but also triggered the interest of left-wing students in Medan, who since then have supported the peasants morally, with public campaigns and legal advice. After long years of procedures the legal path was actually successful: the high court granted them the land and the state plantations had to pay them back the tenure for the whole period of the dictatorship. This was not the happy ending of the story, given that the legal decision has to be enforced in the anti-communist swamps of corruption, which surrounds the state plantations. So far the state plantations have neither paid back the tenure nor do they allow the people to enter the land – saying that it might be the fact that the land does not belong to the plantation, but that the oil palms do. Further occupations and clashes followed; the people themselves have now hired 'thugs' – people from the neighbouring villages to whom they promise a share of the possible gains. The Suharto dictatorship put loyal high-rank army people in charge of the state plantation’s management, which resulted in them becoming centres of corruption. There is close cooperation between the state plantation, police, army and former state trade union. Left-wing trade unions had modest successes in organising coolies during the period of Reformasi 1998 to 2002. Under the pressure of violence, intimidation and bribery most of these successes have been dissolved. There are still many trade unions and NGOs which somehow take care of the peasants. They offer training in improved methods of agriculture, they organise public campaigns and legal support in cases of conflicts. Practically no one cares for the plantation labourers – apart from the remarkable exception of the KPS in Medan. Even after long working hours the wages of the day labourers are too low to eat and send their children to school. Even if both parents – and in many cases the children, too – work on the plantation. They try to survive by engaging additionally in small scale agriculture, by relying on mutual aid amongst neighbours, and by taking day loans from usurers. The children don’t have a chance to continue education after primary school. A military coup brought Suharto into power. In the following month several hundred thousands of 'communists' were massacred, first of all on the countryside.